Several Northfield community leaders are quoted in the piece, including LG co-host Ross Currier with his NDDC hat on, former Mayor Keith Covey, Community Development Manager Brian O’Connell, Economic Development Authority chair Rick Estenson, and former city councilor Dana Graham. 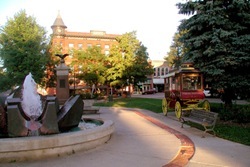 But small towns that have successfully revitalized their core – the most obvious examples are Stillwater and Red Wing (see separate story) – have a unity of purpose and a guiding organization to implement the vision that some say is the final missing piece to making downtown Northfield even better. The News story does a pretty good job of illustrating some of the issues facing the public and private sector of downtown advocacy. One thing I’ve never understood is why the EDA hasn’t/doesn’t take the lead; all the structural features are in place for it to do so. However, there’s just a different kind of momentum going with the EDA. The EDA’s mission of increasing jobs and tax based tends to focus almost exclusively on larger businesses, or at least not the downtown ones, since those are mostly small service and retail businesses. But as Keith Covey was quoted as saying in the News article, the cumulative effect is that “downtown” is one of our largest employers. I’m not necessarily advocating that the EDA “should” do this; I served on the EDA from 2000 to 2006, and I never lobbied strongly for it to take on the task during that time. I’m simply saying that there isn’t an absolute need to form another organization when the structure already exists for the EDA to be that unifying, umbrella organization. It has state and municipal enabling resolutions which give it more potential power than the other orgs, plus the EDA has the authority to bond. While I am “thinking about it” and don’t have time right now for a lengthy answer to what I think was a number of quotes in the Northfield News that were simply out of context and not complete in their article, I will find time to come back with a better (more extensive) response soon. I may have to come back here and respond in more detail to your comments, like Rick. I was at a fiber optic meeting this evening, working on another issue Ross told me was once called your passion as well… bringing fiber to the community. Something to help both big and small companies. Now we go back to the EDA and another “ouch”. The EDA has been working with numerous downtown businesses so again I find these comments unfair. All of the tools we have to entice business development are focused on downtown. In the last 7 months the EDA has assisted….Sketchy artist, Art on Water….Norman Butler, Cocoa Bean, ID Insights so ….again Tracy “ouch”. Char, I’m not sure why the “ouch”. I don’t for one second mean to imply that the EDA doesn’t have enough on its plate the way it is, or isn’t doing anything valuable. I’m simply pointing out that IF (and it’s a big “if”, not a foregone conclusion) Northfield needs an organization to provide the overarching vision/structure/support/funding for downtown, and a means to pull it all together, the EDA may be a very good candidate, since many of the organizational elements are there. On the other hand, there may be some very good political reasons why the EDA should not be the lead agency. Articulate the vision (one sentence) for downtown that has emerged from the numerous meetings about this issue that paints the picture 5, 10, or more years from now, that everyone has already agreed and endorsed (unity aspect), indicate who is the lead organization, and where the strategic plan for downtown is hosted so we can download and read it and align our little bit of economic development work to this large vision and strategy. Avoid more analysis, use what has already being done, and start think of downtown as an investment portfolio and look into its future health the same way as one would for a diversified investment portfolio. From that framework, answer the question: What is the vision in terms of the business mix and strategies to accomplishing such business diversity, and what it would mean in measurable dollars and in historical and cultural wealth for our town as a result of the leadership and the investment choices that such vision would call for. No downtown has gone anywhere without the power of entrepreneurs, and if the entrepreneurs who will make Northfield downtown better don’t feel supported and enabled to succeed through clear vision and leadership from the organizations in-charge, neither one goes anywhere, new ideas and strategies will be brought down and the bright and entrepreneurial will find other places to invest their resources. and perhaps a long night. Next time I will be sure to get my rest before I even attempt to read or respond to these blogs. The missing piece may be the piece suggested by Joe Grundhoefer (and others). He suggested that the downtown form a Special Downtown Service District. It would work like a townhouse association, where everyone participates in paying dues so that services can be purchased, and actions taken as a collective group. Ironically, this idea failed. The cynical take on the failure is that it was due to many downtown businesses thinking that the rest of the town should be supporting them just because they were downtown. You and I don’t always agree on everything but there are certainly a few subjects on which you and I often agree. I think that recognizing the importance of looking at the relationship between the private and public sectors is one subject where we often find ourselves coming from a similar perspective. I think that you’ve put your finger on the heart of the challenge in actually implementing ideas – balancing the roles, responsibilities and resources of the private and public sectors in pursuing shared objectives. The private sector participants, the Chamber, the EDA and the NDDC learned long ago to not let the occasional but inevitable policy disagreements in anyway undermine their history of successful collaboration or distract them from their experience of productive cooperation. The concept of a Special Services District, or as Joe prefers, a Downtown Management District, gives more responsibilities and resources to the private sector and, perhaps it could be said, more leadership in terms of having some more control of it’s own destiny…or snow removal. My sense of why it wasn’t further pursued last year was the seventh year of 30% average increase in property taxes for downtown building owners. Adding an additional assessment on top of those increases was just too much of a burden to take on at that time. P. S. Gordon Van Wylen is the father of EDA member David Van Wylen. Wow! It really IS a small world. I had no idea that you had already received input from a Hollander, a Van Wylen no less, I should bow out now, as I am not a native Holland Michigander, but a native Minnesotan who might be moving back in the next few years. (Thus my research into Northfield) Glad to see you’re on top of it. Keep going. Oh, BTW, did Mr. VanWylen tell you all that the city has tiny snowplows that plow all sidewalks in the city limits, and also picks up leaves from the curbs in fall? Lots of vision here. Jerry: The last sentence of your referenced article states, “… DDA [Downtown Development Authority] funds are received through an assessment on property within the district i.e. property owners.” Are you advocating for such a district? Wouldn’t it be better if the downtown owners voluntarily joined together to make the downtown better? I think the idea you mentioned earlier is a good one and probably a better approach for Northfield than the one in the article. Should such an organization fall under the umbrella of the NDDC, EDA or the city? I’m not sure. I currently give money to the NDDC because I appreciate the advocacy role they play for downtown now. I wouldn’t mind seeing that role increased and would contribute to support it. I was unaware of any such plan, so I did not oppose it. I agree with Ross that it might have failed because of the burden of property taxes issue. Either way, I don’t believe in any sort of entitlement. With regard to how I run my business, I want people to patronize it because I am competitive. I hold my prices down to compete with internet retailers and chains like Target, B&N, Half Price Books etc. I have changed the selection to reflect customer demand. I removed 30% of the books to open up the space and make it more comfortable and browser friendly. I do believe in a level playing field and if we value downtown, we need to invest in it. Just as we need to invest in our highways and a business park. Currently if you want to open a business downtown, there are many hoops to jump through. Look at the development of Sprazzo, Froggy Bottoms, or Norman Butler’s plans for the Contented Cow. Highway 3 is a much easier go of things. Is the vision for downtown separate from the vision for Northfield as a whole ? David: There isn’t even one vision for downtown. Some want it to be an open air museum and some want it to be a cultural center. For those trying to make a living, like Jerry, they need the downtown to be, first and foremost, a commerce center. If downtown works as a third place, it enhances the commerce and contributes to our community economically and culturally. But David is correct, I chose to locate my store downtown because I think it is the best place for commerce for my business. Nfld News Managing Editor writes about her article on downtown in her Sat. staff column: Into editor’s life, a little learning falls. At a daily, a story like the one we did on downtown – one that points out an obvious issue that has been publicly discussed for quite some time – would maybe garner a letter to the editor or a call or two. Not so, here. Apparently, the downtown is a hotter topic than I realized. I received very public and negative feedback on Wednesday. I still believe the story hit the mark, but when the topic is sensitive and the community is small, every sentence gets heavily scrutinized and debated.